This interesting item came out in Borneo Post in April or May last year..
Any of you guys and gals who are interested in Sarawak history, especially the Brooke era, should try to visit this Expo about the last Raja Muda of Sarawak, Anthony Walter Dayrell Brooke when it opens . Anthony Brooke passed away on 2nd March 2011 at the age of 98. Click HERE for more details in one of my previous postings. The Expo opens on 8th June and continues till the end of the month. I for one will try my best to be there. KUCHING: The passing of Anthony Walter Dayrell Brooke, who was the Raja Muda (heir apparent to the throne of the White Rajah) before Sarawak was ceded to the British, marked another important chapter in the history of Sarawak. Brooke, who was 98 years old when he passed away in New Zealand on 2 March, 2011 is survived by his wife Gita Keiller, son James Bertram Lionel Brooke and a daughter Celia Margaret Brooke. An exhibition in his memory, highlighting his ties and links with Sarawak, is being held at the State Library in Petra Jaya here 8 to 30 June. 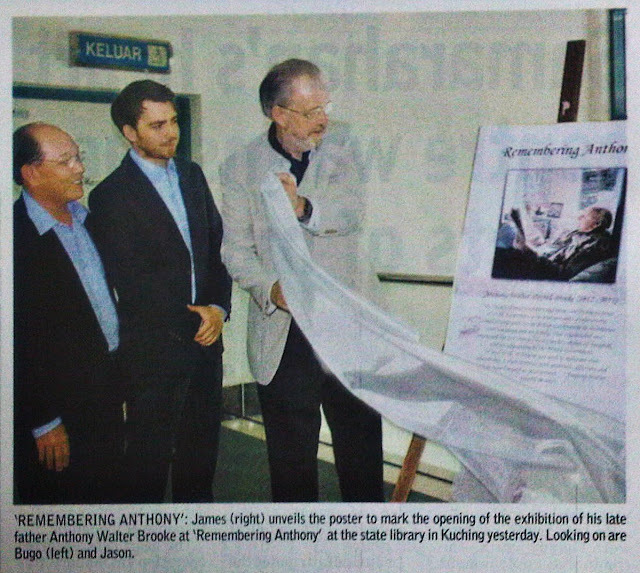 The Chairman of the State Library Board of Management, Tan Sri Datuk Amar Hamid Bugo, officiated at the launching of the exhibition by James Bertram Lionel Brooke, yesterday. In his short speech, James Brooke described his father as a man of integrity and strong will. He said he regretted not having the opportunity to get close with his father who was a travelling man and was constantly away. He said the family had to leave Sarawak hastily in 1941 due to the impending Japanese conquest of South-East Asia, and their return to the UK where they were relocated at Liverpool. James also spoke briefly about the decision of the Third Rajah Charles Vyner Brooke to cede Sarawak to the British government in 1946 in return for a pension, thus ending the rule of the White Rajah. Meanwhile, the small but informative exhibition showcases Anthony Brooke’s life from his early years to the period when he was appointed the Raja Muda, and his opposition to the cessation of Sarawak to the British. Anthony’ Brooke’s anti-cessation campaign ended in 1951 when the spread of communism became a greater threat to the stability of Sarawak. When the anti-cessation movement came to an end, Anthony Brooke devoted his time to promote peace, unity and the protection of the environment and the indigenous people. He divorced his first wife, Kathleen Hudden in 1965 and remarried in 1982.He and his second wife Gita Keiller visited Sarawak in 1983 to participate in the 20th anniversary celebration of the formation of Malaysia. Anthony Brooke’s month-long stay in Sarawak (from 18 Aug to 18 Sept) in 1983 gave him the opportunity to meet with old friends, former co-workers and government officials, being invited as guest of honour at numerous functions and excursions to other parts Sarawak. In his later years, he settled down at Wanganui in the north island of New Zealand, and to keep alive the fond memories of Sarawak, he even had a special memorabilia room called the Sarawak Room’ in his house. The exhibition reveals that Anthony Brooke, towards the end of his life, forgave family members “who had conspired to deprive him of his singular inheritance”. Besides the pictorials and written stories, there was also a small collection of government documents that were related to the anti-cessation period. Al so present at the ceremony were the State Library’s Acting Chief Executive Officer Japri Bujang Masli and Anthony Brooke’s grandson, Jason Brooke. “By the act of your ancestors and mine, and by the accident of birth, I was born to be your servant – a relationship formally recognised by the British Government in its treaties with Sarawak and my family. That relationship was impugned but not changed by my uncle’s cessation of Sarawak, and its annexation by the British Government. In good or ill, so long as you wish to maintain that relationship, I shall continue with gratitude, affection and pride to regard myself as your servant” – Anthony Walter Dayrell Brooke. Born and mainly educated in Huddersfield Anthony has a great deal of sales, marketing and general management experience in such diverse areas as manufacturing, service, export, high value capital goods, high volume, low margin etc. WJ, what is the above comment all about? I think in the wrong place lah ..